On Wednesday, the European Commission slapped France with a stern legal warning over its "shameful" campaign against Roma gypsies. Since the end of July, when Sarkozy ordered a clampdown against Roma or Gypsy immigrants from Romania and Bulgaria, more than 1,000 Gypsies have been flown home, being given a 300€ (£250) subsidy (bribe?) to leave the country after their makeshift settlements were destroyed. 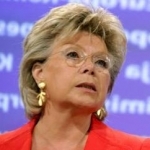 Vivian Reding, the European Commissioner for Justice, Fundamental Rights and Citizenship, now demands that the Elysee's Palace prove that its policy is not singling out an ethnic minority, which is against the EU's Charter of Fundamental Rights (and against French law too ! )before the deadline of 15 October . The French campaign has unleashed a deluge of criticism from senior officials within the EU, the United Nations, and the Vatican. Mrs Reading even went as far as to compare France's actions to the Nazi persecution of Gipsies during the Second World War, explaining that France currently “deprives [Roma] citizens of their fundamental procedural rights”. Therefore, in accordance with what she declared a few days ago, the Commission officially warned France it could face legal action "within weeks" for breaching the spirit of European law on the free movement of EU citizens.